Vale Solution 4X is formulated for heavy weight individuals and those with high drug metabolite levels due to habitual use. Vale Solution 4X is formulated for heavy weight individuals and those with high drug metabolite levels due to habitual use. Extremely effective as a "day of " treatment, Vale 4X starts working 45 minutes after use and lasts for approximately 3 to 5 hours depending body weight and drug use history. Fortified with an exclusive blend of vitamins, minerals, and nutrients, Vale 4X is far more potent than the average carbo drink. An assortment of vitamins help flush your urinary tract while maintaining the concentrated urine color that is crucial for avoiding diluted sample detection. Various minerals combined with creatine help keep your urine testing normal further preventing suspicion or retests due to dilution. Stay well hydrated on a daily basis. While you may not always know when a random drug test will be, you can always keep yourself hydrated, improving your body's ability to clear drug metabolites. Avoid any unwanted substances for at least 48 hours prior to testing; a longer time frame will result in a tremendous improvement in your drug test results. On test day do not drink excessive amounts of water; limit yourself to no more than 1 glass an hour in addition to Vale 4X. 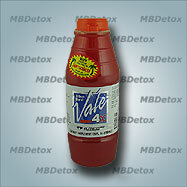 Remember that fast acting detox supplements are temporary and time your use of Vale 4X properly. Contains Phenylalamine. It is recommended that you consult a nutritionist when creating a supplement regimen. If you are pregnant, nursing, or otherwise have special needs consult your doctor.